Samsung has just released a new bullet camera to the market. The SNO-5080R is a 1.3 megapixel, weatherproof network bullet camera with a built-in varifocal lens and IR LEDs. This nifty little guy is capable of producing HD 720p images in both day and night settings making it perfect for internal and external use. The SNO-5080R is very easy to install and this can almost be done right out of the box due to the fact that it incorporates all the needed components of an external IP66 rated weatherproof camera including the varifocal lens, sun shield and bracket. The built-in IR LEDs allow the SNO-5080R to capture high definition 720p images during both daylight hours and pitch-black darkness allowing you to place it outside an important building or inside a warehouse for full 24-7 recording. 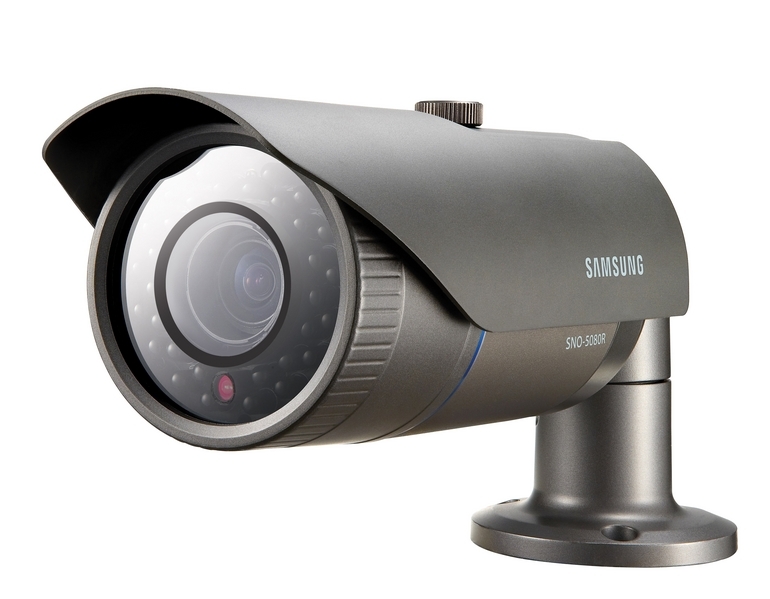 This camera also features Samsung Techwin’s WiseNet1 DSP chipset in order to deliver a lot of advanced functions such as license-free Intelligent Video Analytics (IVA). This includes an optical tripwire as well as an enter/exit direction detection. Also included is an Appear/Disappear function that detects the movement or theft of objects. IVA also includes a scene tampering function which creates an alert for certain things like the lens being obstructed or unauthorized movement of the camera away from its usual field of view. The H.264, MPEG4, MJPEG and JPEG compression methods which are incorporated into the camera give you the ability to transmit images to multiple locations simultaneously at differing frame rates and differing resolutions. This allows different, authorized users to simultaneously monitor live images at a single location while recording video surveillance at another location at the same time. All this is also achieved while POE, or Power Over Ethernet, reduces installation costs by providing both power and video/audio through a single connection. Also featured with the SNO-5080R is Samsung Super Dynamic Range (SSDR) technology. This automatically lightens up dark areas within an image while maintaining the brighter areas at the same level in order to allow operators to view objects that would normally be hidden by shadows. The SNO-5080R also features Samsung Super Noise Reduction (SSNR) in order to eliminate image noise in low light conditions allowing you to save bandwidth and recording space. The Samsung SNO-5080R is now available and comes with full support services from Samsung Techwin Europe Ltd. which includes a free system design, free technical support and a full three-year warranty.